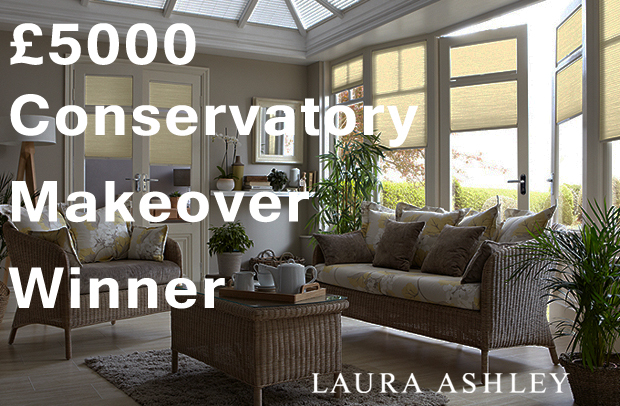 Last February Laura Ashley teamed up with Daro & Thomas Sanderson to provide one lucky competition winner with a complete conservatory makeover worth £5000! The response was astonishing with over 20,000 people vying to spruce up their beloved conservatories. The winners were chosen from random and Mr & Mrs Newton from West Sussex were the lucky couple. They are delighted and surprised. Congratulations to them both. Laura Ashley was invited to the Newton’s home to take a few pictures of the finished article. Mr & Mrs Newton were provided with £5000 worth of voucher with which they had £2000 to spend on Laura Ashley Rattan Furniture. They immediately fell in love with the Arley range from the available six suites in our Laura Ashley Collection. Mrs Newton chose the Arley as she wanted to have a suite that she could curl up, get comfy, read her favourite book, relax and admire her new space. Mr and Mrs Newton quoted as saying “We were delighted to win the Laura Ashley conservatory competition, the conservatory blinds have transformed the room, and the furniture and accessories are simply stunning”. The Millwood Camoille fabric compliments the light frame of the suite bringing through the sophisticated yellows and creams to provide a great backdrop for the space. Complemented by the stylish Laura Ashley Accessories and beautifully made Thomas Sanderson Blinds, the room is complete as a tranquil place to relax and unwind. Why not visit www.lauraashleyrattanfurniture.com and see our other collection of wonderful Rattan suites and fabrics.